Microsoft Excel is a robust, full-featured tool for workbooks and spreadsheets. Whether you use it at work or at home, using features that save you time means that you can move onto your next chore faster. Download Our “Essential Microsoft Office Shortcuts” Cheat Sheet Now! Here are several convenient ways to fly through your workbooks, spreadsheets, and related tasks quickly. One of the best time-savers for most any task is the use of a template. You may use them in Microsoft Word for meeting agendas, newsletters, or reports. In Excel, templates are just as useful. For project timelines, calendars, invoices, budgets, and more, taking advantage of these convenient pre-formatted tools can definitely save you time. Obtaining templates that you need is just as easy as using them. The Microsoft website offers a variety of Excel templates for calendars, planners, expense trackers, and time sheets. Vertex42 has a nice selection for schedules, budgets, to-do lists, and balance sheets. Another great resource is Spreadsheet 123 for invoices, inventory, sign-in sheets, and attendance forms. If you have a lengthy spreadsheet containing tons of data, you may have to scroll too far down or even across to view it all. This means you will lose sight of your headings and find yourself constantly scrolling back to see them. However, if you freeze the rows and columns, then those headers will remain as you move through your spreadsheet. Navigate to the View tab and select Freeze Panes on the ribbon. In the Freeze Panes dropdown, select Freeze Top Row, Freeze First Column, or choose both if needed. Now when you scroll up, down, right, or left, you will notice your headers will remain visible. To unfreeze those rows and columns, just select Freeze Panes command again and click Unfreeze Panes. Note that in older versions of Excel, the process is a bit different. Select the cell that is common to both the row and column you want to freeze and then click Freeze Panes. The fill handle in Excel can be a huge time-saver when you need to populate multiple cells and there are a few different ways this feature can be used. First, you can quickly create a list of numbers that count up by entering 1 into the first cell and 2 in the cell below it. Then, select both cells and when the fill handle appears, just drag to populate the cells as needed. When using the feature for dates, you can easily fill a column or row in increments of one day. For instance, you can enter 12/25/16 into the cell, select that cell, and when the fill handle appears just drag to add subsequent dates. This maneuver also works with days of the week and months of the year as well as downward through a column and across through a row. Another handy use for the fill handle is if you need to populate an entire column with the same value for your spreadsheet. If you enter a word or letter, for example, select the cell and double-click the fill handle. This will enter that value into the remaining cells of the column as far down as your spreadsheet has data. If you have a spreadsheet using headings in columns or rows (or both) and decide they would work better the opposite way, there is an easy process to make the change. This saves you from having to retype those headings. Here are the steps to move cells from row headings to column headings. Select the cells in the column that contain the headings. Either right-click and select Copy or click the Copy button on the Home tab of the ribbon. Select the cell in the row and column where you want the headings to start. Either right-click and select Paste Special or click Paste and then Paste Special on the Home tab of the ribbon. Select the checkbox near the bottom right that says Transpose. 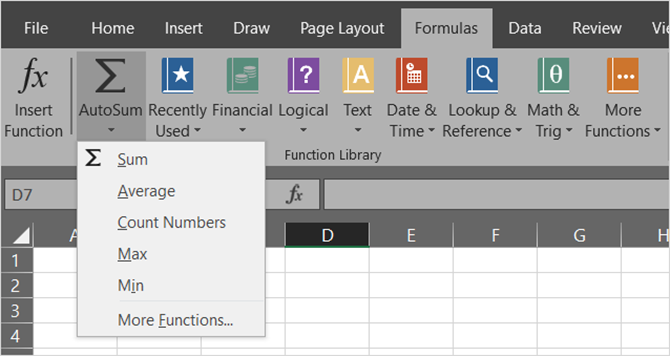 While you may use an add-in that pops a calculator into the sidebar of your spreadsheet, you can also take advantage of the built-in calculator feature. This is convenient when you want to perform quick calculations that are not formulated into your spreadsheet. And you can add the calculator to either your ribbon or Quick Access toolbar. To add the calculator to either location, begin by selecting File > Options. Then choose either Customize Ribbon or Quick Access Toolbar, depending on where you want it. In the Choose commands from dropdown box, pick All Commands. Scroll down, click Calculator, and then hit the Add button to insert it into the toolbar. Note that if you choose to add it to your ribbon, you will have to create a custom group and add it there. Select the cell containing the data that you want to link. Either right-click and select Hyperlink or go to the Insert tab and click Hyperlink in the ribbon. In the popup window, select Place in this Document. Then enter the text to display in that cell, a specific cell reference if desired, and the spreadsheet in the workbook with the data you are linking to. If you are an avid Excel user, then keyboard shortcuts can certainly save you time. While there are almost too many keyboard shortcuts to list, here are several that can speed up your tasks. F4 (or Fn + F4) to repeat the last command, including formatting changes such as color or font. Alt + H, E, A to erase the contents, formatting, and other data attached to the selected cells. Ctrl + W to close a spreadsheet and Ctrl + O to open one. Ctrl + Shift + Colon to enter the current time and Ctrl + Shift + Semicolon for the current date. Shift + F9 to calculate the active worksheet. Shift + Tab to move to the previous cell or option. Ctrl + Home to move to the beginning of the spreadsheet. Ctrl + Page Down to move to the next spreadsheet in a workbook and Ctrl + Page Up to move to the previous one. Some might think that working with formulas in Excel is too time-intensive to get into. But even for simple equations, these built-in functions can definitely move your spreadsheet work along faster. Unless you have moved or deleted it from your ribbon, the AutoSum button should be on your Home tab. This handy feature gives you the most common formulas with a click. You can add, count, or average a group of numbers or obtain the minimum or maximum of them. Just click the arrow on the AutoSum button to choose your formula. In addition to the AutoSum feature, your Formulas tab contains even more options. Each formula is grouped into a category to make it easy to find. You can select from financial, logical, math, statistical, or engineering functions. But for the most widely-used formulas, the AutoSum feature is quick and convenient. 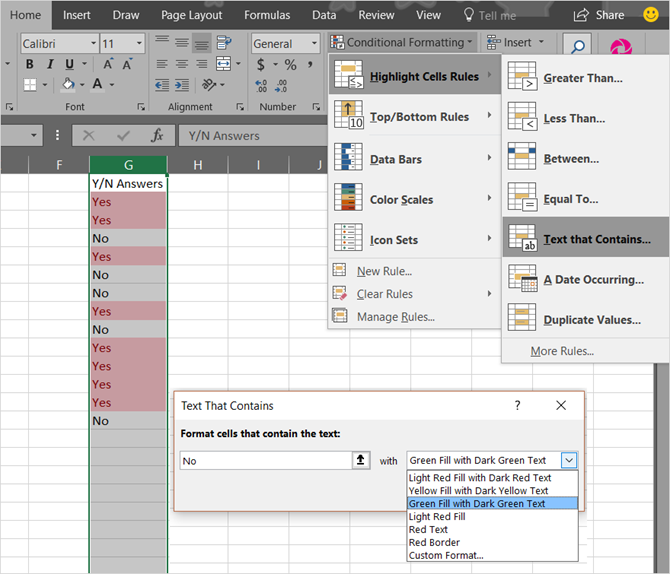 Conditional formatting is another one of those Excel features that many might find intimidating. However, for data that you want to see pop off the page, it’s a great tool. For example, say you have a spreadsheet of data from a survey and at a quick glance you want to see how many Yes answers you have as opposed to No answers. These steps show you how to apply simple formatting. Select the cells containing the Yes/No answers. On the Home tab, click the Conditional Formatting dropdown box. Choose Highlight Cells Rules and then Text That Contains. Type the word Yes in the left box and choose the formatting for it from the right box. Follow the same steps for the No answers. You will then see all of the Yes and No answers formatted the way you chose, making them easy to spot. If you plan to continue to add data, you can also apply this conditional formatting to the entire column or row instead of just a group of cells. This way, future data will be automatically formatted as you enter it. Eager to learn more? Have a look at our dedicated article on conditional formatting. 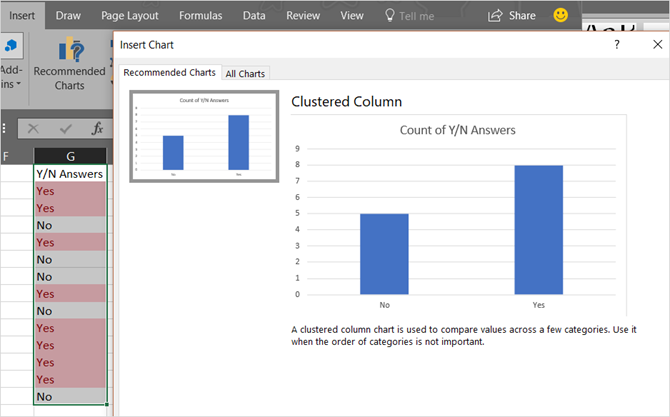 The Charts feature within Excel is a terrific tool for displaying your data visually. And, you can choose from a variety of chart types such as pie, bar, line, column, and many others. 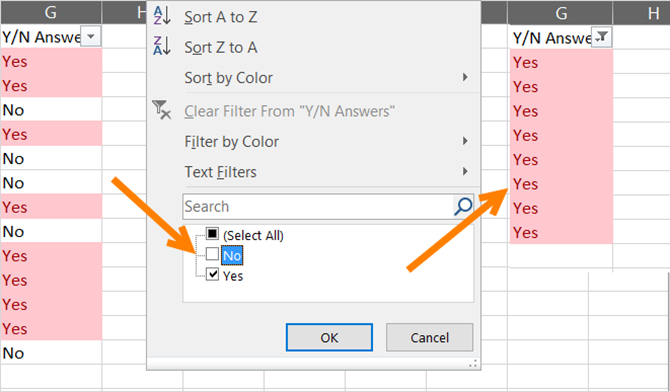 Using the above example of conditional formatting for Yes/No answers, you can insert a chart with just a few clicks. On the Insert tab, click Recommended Charts. With this option, Excel will take your data and put it into the type of chart it fits best. If you like the chart, click OK and it will be inserted into your spreadsheet. This is the easiest and fastest way to create a chart in Excel and takes only a minute. However, if you do not like the chart created for you, you can click the All Charts tab in the popup window and experiment with other types. For further information on formatting your chart, learn all about creating a pie chart. When you have a spreadsheet containing many columns of data, you may want to sort or filter it all by a certain column. While there are a couple of ways you can do this, using a filter is the quickest and safest way to do it. Select the entire sheet by clicking the triangle button next to your first column at the top left. On the Home tab, click Sort & Filter. That’s it! This fast move will put an arrow into the first row for each of your columns. When you click an arrow, you can sort the entire sheet by that column in the way you choose. If it’s a date field, you can sort from oldest to newest and if it’s a text field, you can sort alphabetically. In addition, you can filter the data to see only the entries you want. When you click an arrow you will notice checkboxes next to your entries. Marking and unmarking these boxes will filter the data so that you see exactly what you need. The nice thing about using the Filter feature is that it does not negatively affect the rest of your data. If you sort an entire sheet, Excel will adjust all columns. And if you filter, Excel will simply hide what you do not want to see. If you use other Microsoft Office applications such as Word, you may already be familiar with the Format Painter. 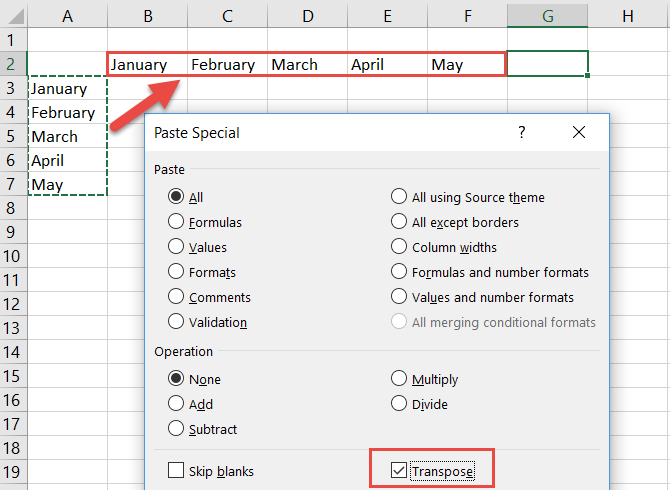 In Excel, this convenient tool lets you apply the same formatting from one or more cells to others with a single click. Select the cell, group of cells, row, or column that you want to copy the formatting from. On the Home tab, click Format Painter. Select the cell, group of cells, row, or column that you want to copy the formatting to. This is a fantastic way to quickly apply helpful formatting of cells to others without manual work. Are there times when you need to work with more than one Excel workbook at the same time? Maybe you need to review data, compare it, or even copy data from one workbook to another. Excel provides a useful set of viewing features to help. Head over to the View tab to check out these options. Arrange All: When you click this button, you can arrange all of your open workbooks on one screen. Choose from a tiled, horizontal, vertical, or cascade view. View Side by Side: This option lets you choose two open workbooks to view next to or on top of each other, which is perfect for comparisons. 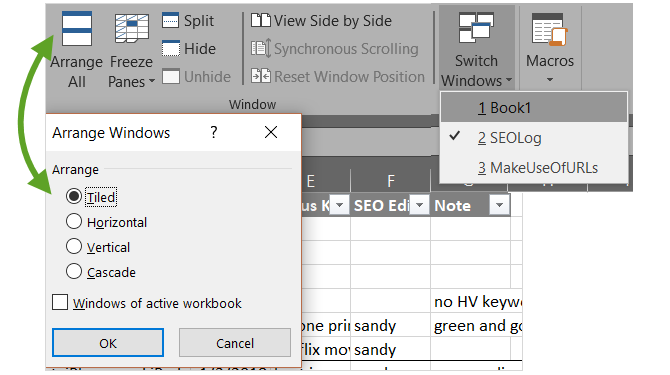 Switch Windows: Click this button when you have many Excel workbooks open at once and want to switch between them quickly. No minimizing and maximizing windows is necessary with this awesome feature. 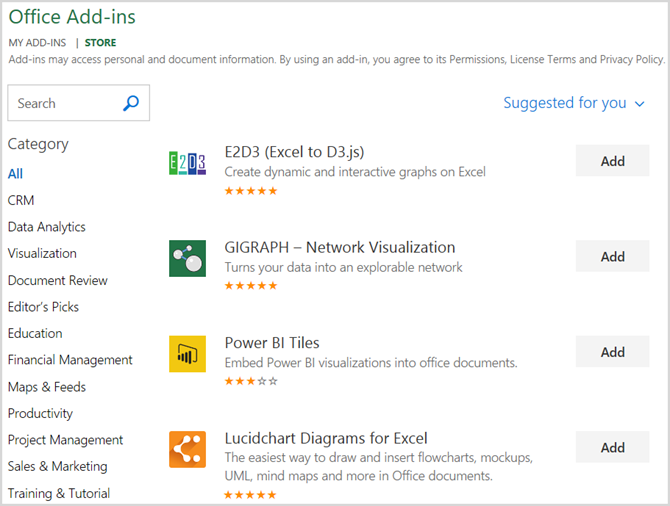 Office Add-ins are similar to browser extensions in that they are tools to enhance your application experience, data, and efficiency. And in Excel, you have many helpful add-ins to choose from depending on your needs. Select the Insert tab and click Store. You can then check out tools by category. For instance, the Productivity category contains add-ins for document automation and a template gallery. And, the Project Management category has add-ins for Gantt charts and activity timers. Some add-ins are free while others are paid, so be sure to check the details before installing one. And if you are looking for free Excel add-ins to help with visualizations, we have you covered. What Are Your Favorite Time-Saving Features? As we all continue to use Microsoft Excel, we keep finding out little tricks that help save us time. Do you have tricks of your own that you use regularly and would like to share with others? Please share those helpful tips in the comments below!